Just as the title says this post is meant as a little status update. I’m currently having little free time – so don’t expect any big things right now. But there are of course still a few things going on which I wanted to let you know about. The project homepage has finally received something that can be called a design. I’m using a slightly modified version of a template which is available for free use. So far everybody I asked liked the colors. Any (different) opinion? Write me a comment and tell me! Also the homepage offers some limited content now. It’s still not much but it’s a beginning. Free time is scarce and the process of building the homepage and maintaining it is something which will take me a while to get familiar with. So this does of course have a huge impact on both my blogging activity here and on the EERIE development. While I’ve certainly only used a small percentage of all the functions WP.com offers me for free, I’m pretty much accustomed to work with these after more than a year of blogging. Despite that the world WP.com is slowly getting too small for me and the needs of this blog. On the one hand it offers a lot of features I never felt the need for. On the other however there are features which it doesn’t provide and among which are some I’d really like to use. The one big problem I was having for quite a while was that I’d like to adjust the width of the two columns the blog page consists of. Not possible with WP.com. And now finally with the homepage up the need arises for a consistent theming. 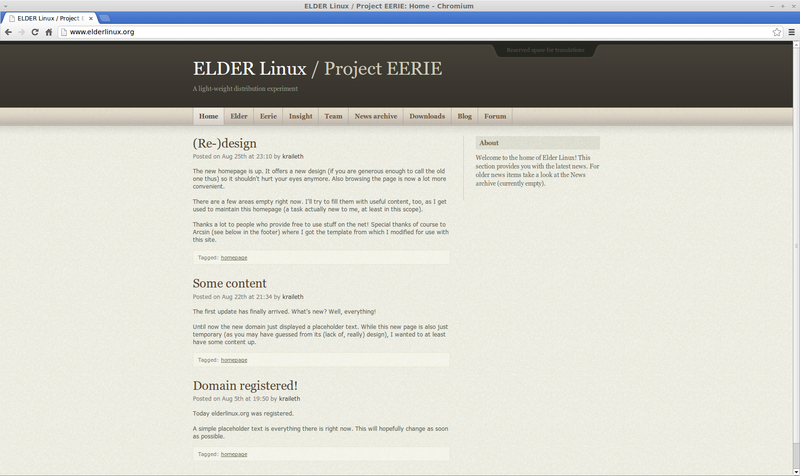 The template which I use for the page even offers a WP.org theme, too. But it’s not possible to use it with free WP.com. These two issues are the main reasons why I’m considering to move a way from WP.com free hosting. This is also why I’m going to try out if I’m able to manage a WP.org installation myself. The plan is to set one up on a private pc and play around with it until I’m satisfied. The next step would be researching how to migrate this blog to a self-hosted one. I haven’t found the time to do anything in that direction but I’ll keep you updated. So far I’ve started compiling a list of GTK+ based file managers. I’m not done with it, yet, but I hope that I can start testing them soon. Afterwards, just like with Qt, I intend to test some GTK+ text editors, too. That would conclude the GTK+ series of posts. Recently I’ve come into a situation where a better version of the DDD would have come in handy. For that reason I plan to soon give it another shot, too. And the desktop comparison of last year has been one of the strong points of this blog. However I feel that a lot of things have changed since then. E.g. OpenCDE is gone, Consort has arrived and it might be nice to compare new values against the ones from last year! Maybe it is a good idea to repeat these tests? Feel free to comment on that issue. I’m slightly in favour of repeating it but – again – time is the limiting factor here. Good question. There’s currently a whole lot of things which I’ve started working at. Most likely I’ll try to get the GTK+ file managers done first. But at this point I won’t promise anything.